Essential: Bachelor's Degree/Diploma in Nursing by any recognized Institute approved by Nursing Council of the State/GoI. Registration from Nursing Council of India. Experience: At least two years experience of working in a Hospital Preferably in Pediatric Critical Care Management. 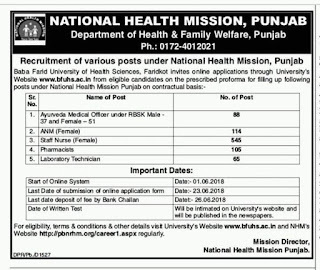 The application for the posts mentioned in this notification will be received online from 01/06/2018 onwards and the last date of application is 23.06.2018.